Ready-Made Cable Assemblies Now Available! The IN-USBH In-Line Signal Conditioner adds digital USB output to mV/V pressure or load transducers. Free downloadable OMEGA PC software takes the data from the transducer directly to the digital domain, turning your laptop or Windows® tablet (with USB connection) into a virtual meter, chart recorder, and data logger. Export logged data to spreadsheet format for later viewing/analysis. The PC-connected IN-USBH provides regulated excitation to the transducer so that no external power supply is used. Sampling rates are adjustable up to 1000 Hz for dynamic or slow moving applications. Mounting bracket is included. 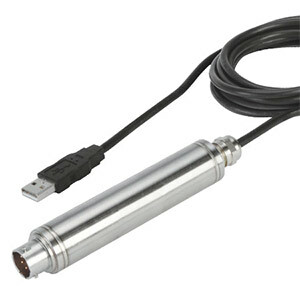 Transducer interconnecting cable can be purchased separately. The IN-USBH is compatible with mV pressure and load sensors that meet the stated transducer requirements. Have your Omega or other brand mV/V transducer calibrated with your IN-USBH signal conditioner at Omega’s state-of-the-art factory! Two options are available: Factory System Setup provides 2-point calibration at 0 and 100% Full Scale values. Factory System Calibration provides 5-point NIST Certified 0-50-100-50-0% of Full Scale value calibration points. Please note the cost of Factory System Setup or Factory System Calibration provides calibration in one direction only (either Compression or Tension for Load Cells, Positive or Negative Pressure for Pressure Transducers). FREE Downloadable Software! OMEGA's Digital Transducer Software allows you to view, chart and log your data from many Omega Digital transducers (pressure, load, torque, temperature, humidity), all in one place! The new IN-USBH In-Line Signal Conditioner extends USB output and software functionality to almost any mV/V sensor. This software is available for FREE download from Omega's FTP site. Poznámka: Signal Conditioner comes complete with mounting bracket and free PC software available for download. * For Factory System Setup (2 point scaling) add £108/€140. For Factory System Calibration (2 point calibration plus 5 point NIST-traceable certificate) add £164/€215. Consult Sales to obtain Setup or Calibration services. NOTE: OMEGA™ strongly recommends purchase of a ready-made Cable Assembly to connect your mV transducer to the IN-USBH, as these cables are created especially for wiring IN-USBH with OMEGA™ transducers, address the Excitation Sense Wiring factor which can affect performance, and offer a flying lead option for OMEGA™ transducers with cables or non-OMEGA transducers. As the Definition of Cable part number table on page 4 of the spec sheet shows, customers can choose type of insulation jacket, wiring code and length of cables not shown in the Standard Cable Part Numbers table.